When a snake expels its meal immediately after ingestion, but before the food makes its way to its stomach, it's called regurgitation. However, if a snake regurgitates food that's partially digested in his stomach, it's referred to as vomiting. Regurgitation is a common behavioral response problem that has easily identified causes and solutions, while vomiting may be an indication of a health concern that should be addressed by a veterinary specialist. The most likely reason a snake regurgitates its food is that it's handled too soon after eating or is otherwise subjected to stress. The stress triggers a natural reaction in a snake, which is to relieve itself of the bulk of its meal in the event it needs to flee. In the wild, a snake would regurgitate its recently eaten food in order to direct energy away from digestive functions and put it toward escaping a predator. A less common cause of regurgitation is if a snake ingests a meal that is too large for him to handle. In this instance, regurgitation would probably occur before the meal is fully through the snake’s mouth -- that's classified as a partial regurgitation. To prevent this, snakes should be fed prey that is no larger than 1 1/2 times the size of the snake’s body diameter. How much stress a snake can reasonably handle varies from snake to snake, with some being more sensitive than others. For example, a pet snake that is used to common household activities, including other pets and boisterous children, may have no problem with having lots of activity around his cage after eating, while a snake that is used to a calm environment may be startled at an unexpected loud noise. For best results, avoid handling a snake for at least three hours after it eats. If you are planning to travel with a snake or subject him to unusual conditions, like displaying him at a reptile show or moving him to new quarters, avoid feeding the snake for several days in advance to ensure there's nothing in his stomach to lose. Also maintain appropriate heat and humidity levels for your breed of snake, which can be effective in aiding proper digestion. Regurgitating a meal is stressful to a snake’s internal system. Not only is the snake not receiving the nutrients from his food, but the regurgitation process also robs the snake of essential digestive acids from his stomach. While a single occurrence of regurgitation should not be of concern, especially if it can be attributed to handling or other stress factors, more than one incident should be reported to a vet to ensure there are no underlying health concerns. Vomiting occurs when a snake orally eliminates food that is already partially digested. You can tell the difference between regurgitation and vomit by the condition of the meal that is expelled. 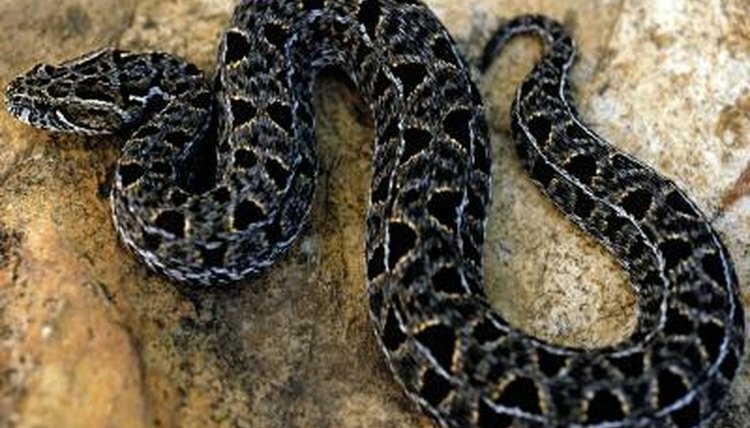 If it appears as it did when it was fed to the snake, it's regurgitation, but if it's partially decomposed, it was likely subjected to stomach acid. While vomiting can also be triggered by stress, there is more likely an underlying health issue that should be addressed by veterinary professional. Are Snakes Aggressive Toward People? What Happens When a Snake Doesn't Digest Food? How Long Do I Wait After I Feed My Snake to Move Him? Why Is My Snake Wheezing? How Can a Snake Swallow Bigger Than Its Head?